Known as il Lucchesino after the city of Lucca where he was born, Testa moved to Rome at the age of 17 or 18 and began his career there by working for Vincenzo Giustiniani, who had employed a team of engravers under the supervision of Joachim von Sandrart (who later wrote Testa’s biography) to record his renowned collection of classical statuary. Soon after, Testa joined the studio of the painter Domenichino where he came into contact with a wide circle of learned artists and theorists, such as Nicolas Poussin and Giovanni Pietro Bellori, whose serious intellectual approach influenced the classicising tendencies and erudite subject matter of Testa’s own work. Following Domenichino’s move to Naples, Testa entered Pietro da Cortona’s studio, but because of his difficult character was quickly expelled. Nevertheless, Testa’s thorough training with Domenichino brought him by the early 1630s to the attention of the influential antiquarian Cassiano dal Pozzo. Testa produced numerous drawings depicting the antiquities of Rome for Cassiano’s famous Museo cartaceo – an ambitious project that involved many artists in the creation of a ‘paper museum’ comprising thousands of drawings and prints recording antiquities as well as natural history. However, the relationship between the two men ended bitterly when Cassiano had Testa imprisoned in 1637 on suspicion that he was going to flee without delivering paintings for which Cassiano had evidently paid. In Rome during the period after 1637 Testa devoted himself to writing a treatise on painting but it was never completed and remained as a collection of handwritten notes. Although his greatest ambition was to be a painter, Testa achieved a measure of success with his etchings and it is through these inventions, together with his drawings, that his name has been preserved for posterity. As is often the case with Testa’s mature prints, which deal with austere or tragic themes, the etching of The sacrifice of Isaac illustrates one of the most dramatic of biblical passages, touching on heroic suffering and the psychological conflict of the father figure, Abraham. Testa’s proclivity for such subjects might have been an extension of his own mental despair: by all accounts he appears to have been an isolated soul beset with melancholy at his failure to succeed as a painter. He committed suicide by drowning himself in the Tiber at the age of 38. The subject of Isaac’s sacrifice is told in Genesis (22: 1–19): God commanded Abraham to sacrifice his only son, Isaac, as proof of his obedience. The story was interpreted as a prefiguration of the crucifixion of Christ, whom the Father sent to be sacrificed. 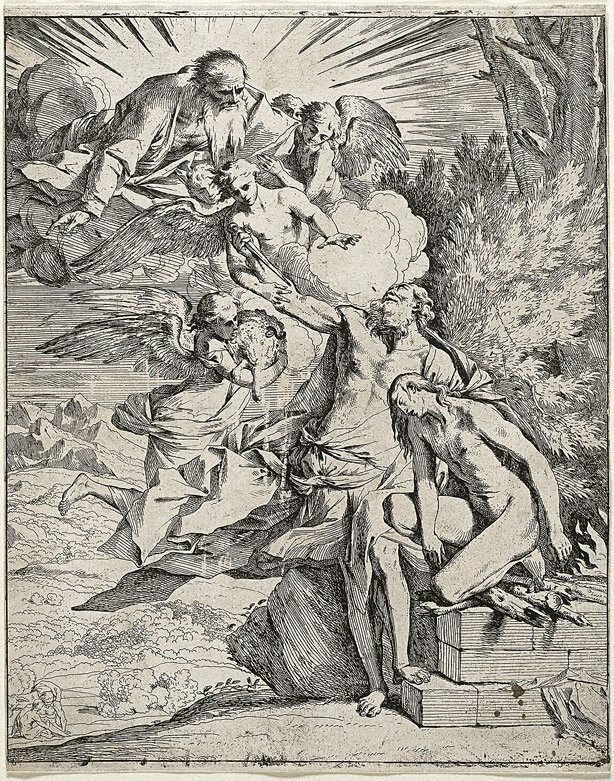 Testa depicts the moment when an angel appears and stays Abraham’s arm as he is about to strike his son; meanwhile, another angel brings a sacrificial lamb to be substituted for Isaac. There is a fully resolved compositional drawing for this etching, in pen and ink, only slightly larger and corresponding to it in most details, preserved in the Teylers Museum, Haarlem.